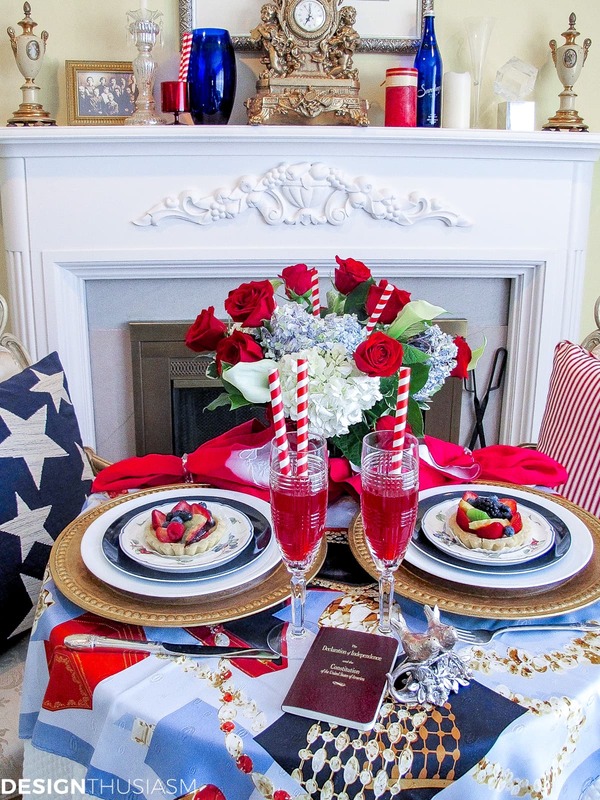 In this post: Patriotic decorations for July 4th can be kitschy. 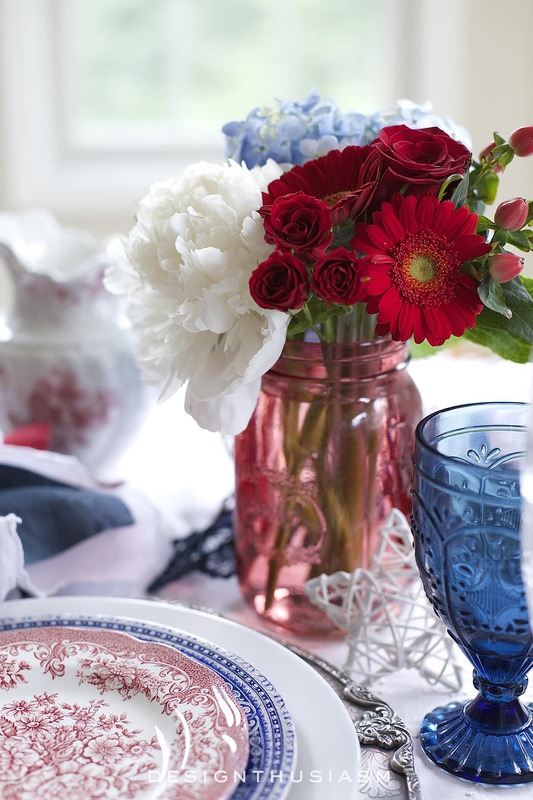 If you prefer elegant Fourth of July table decor, here are some ideas to honor the holiday in style. While everyone enjoys a great party or barbecue for the Fourth of July, the festivities often start later in the day. Since we’re generally out in the evening, I like to do a table setting for an intimate brunch. As always, I start with a great print that defines my color story, here provided by the red, white and blues in the silk scarf, thrown atop the bistro table in lieu of a tablecloth. 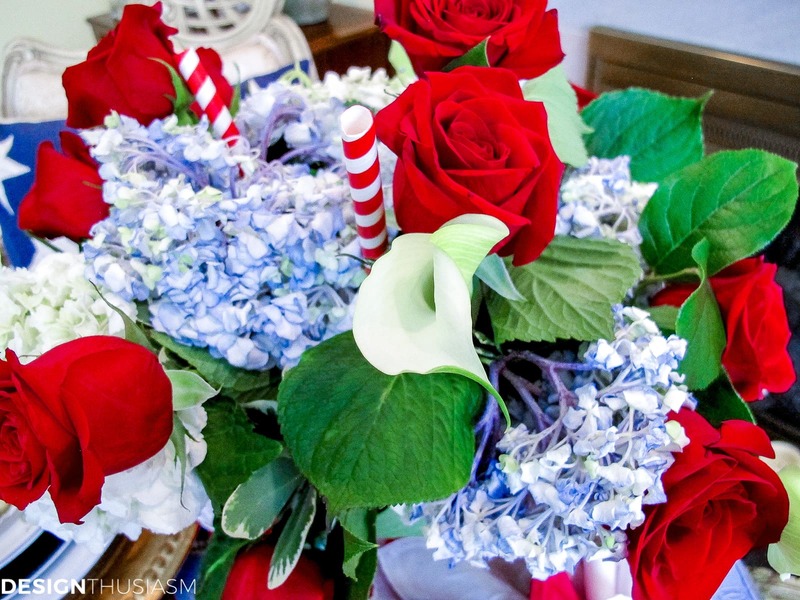 Red roses are combined with white and blue hydrangea for the floral arrangement, which is punctuated by barbershop striped straws. 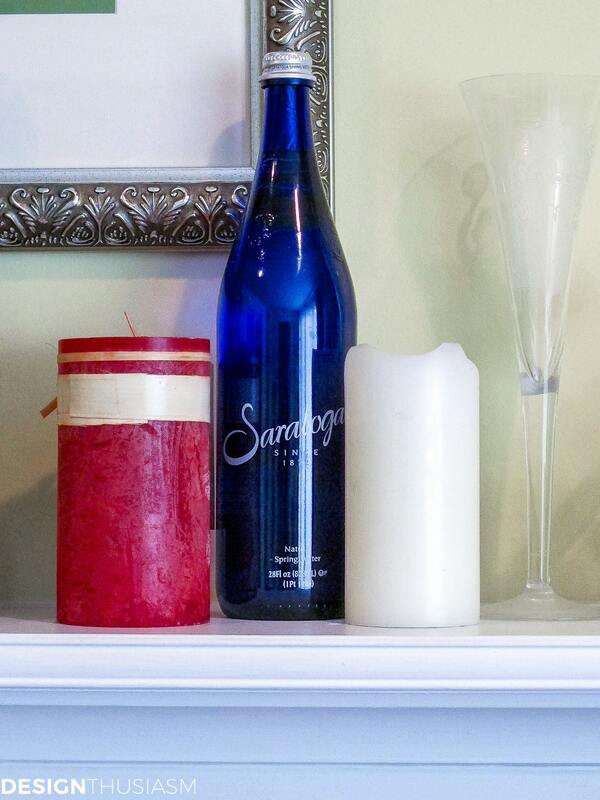 Candles and blue bottles help drive the theme home on the mantelpiece which serves as a backdrop for the setting. The embroidered stars and ticking stripes pillows are among the key ingredients that tell the story of what this celebration is about. What is a celebration without a little sweet? 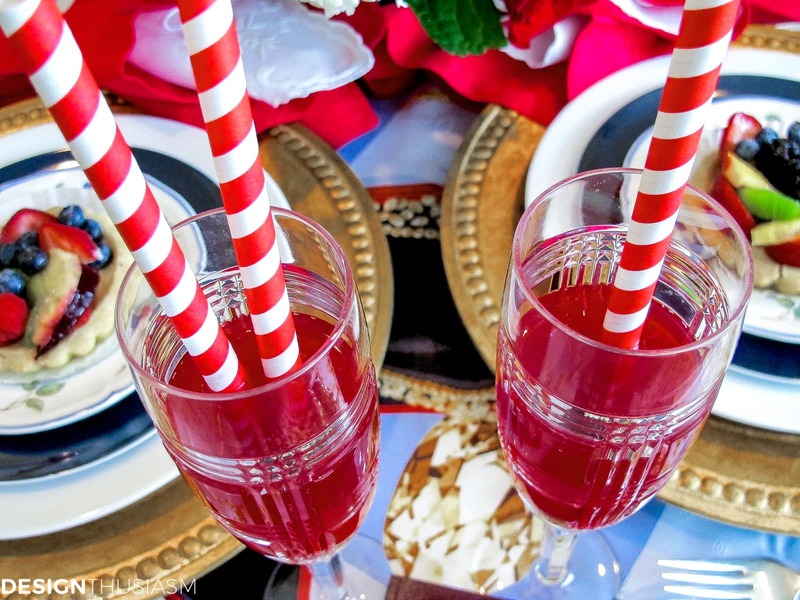 Punch is served in crystal flutes with the whimsical striped straws. 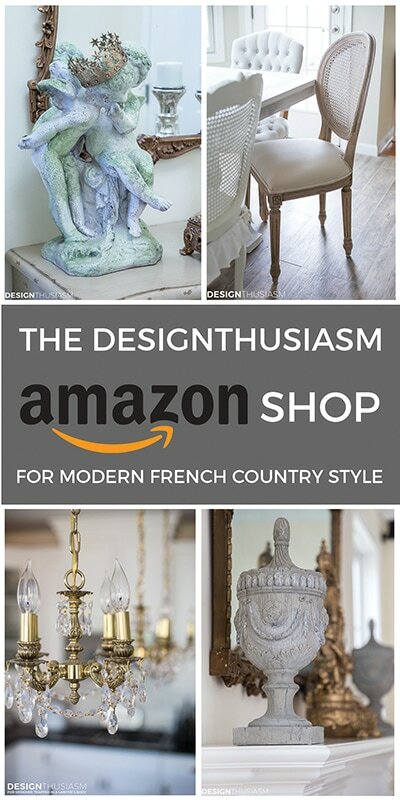 The book no American home should be without. Lovely table…the hydrangeas and roses are perfect together. Very elegant and intimate! Wishing you a peaceful and happy holiday. 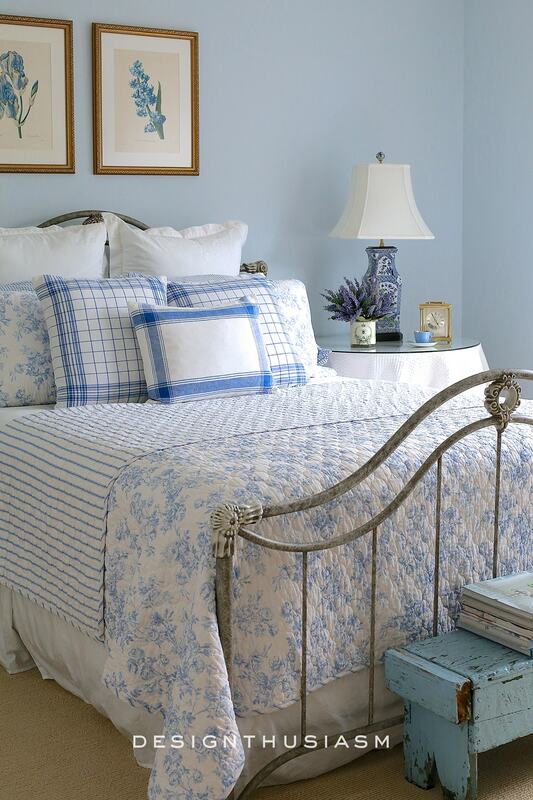 Cute setting and don’t you just love that star pillow. I love the textured stars. Thanks for coming by and I would love to have you join wow us Wednesdays, too. 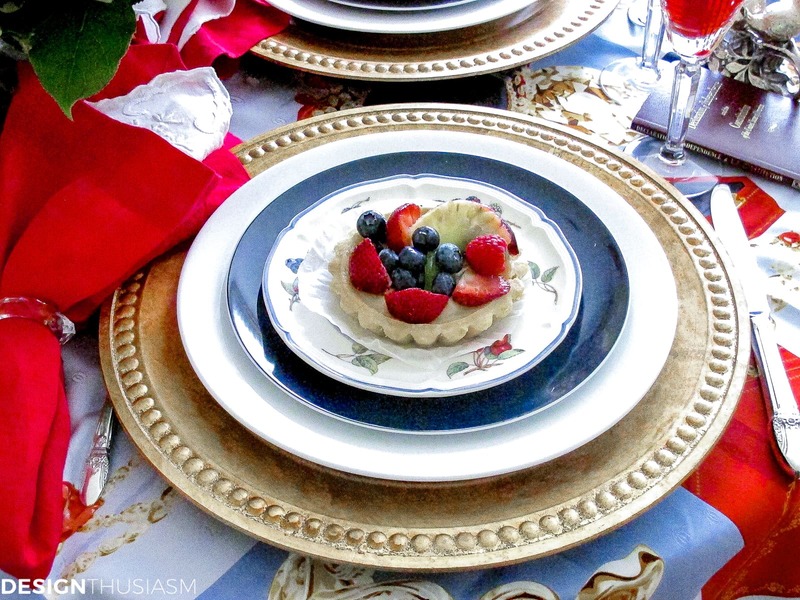 Your brunch table setting is perfect and beautiful! I love the combination of hydrangeas and roses. 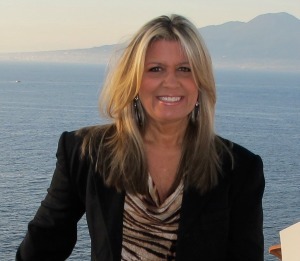 Thanks so much for stopping by my blog for a visit. Thank you too Mary Alice!! OMG, this is gorgeous! What a lovely idea!! Enjoy and Happy 4th! Thanks and right back to you!! I would love to have brunch at that sweet table and I have always thougt the villeroy and boch cottage dinnerware is charming . 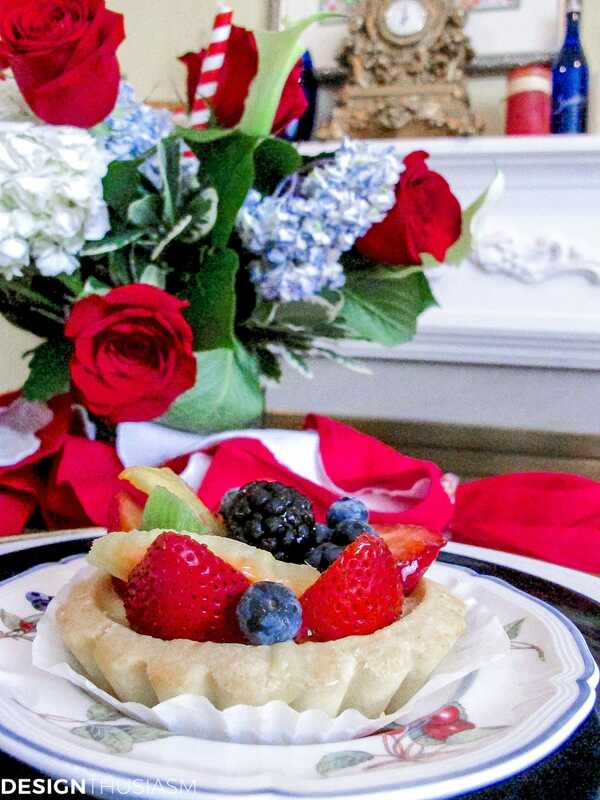 . . especially topped with that yummy tart! What a truly pretty patriotic party. The scarf is gorgeous. Thanks! Right back to you!! 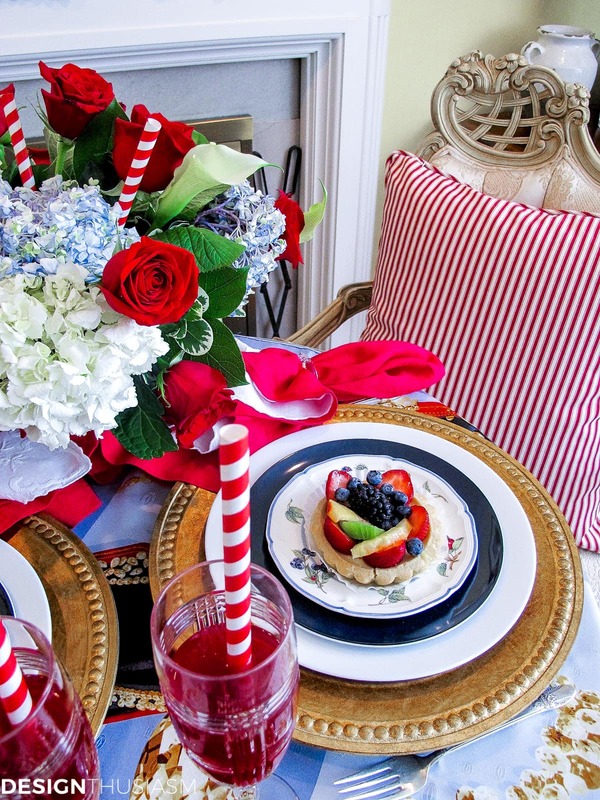 Love the patriotic brunch setting. Everything looks lovely. 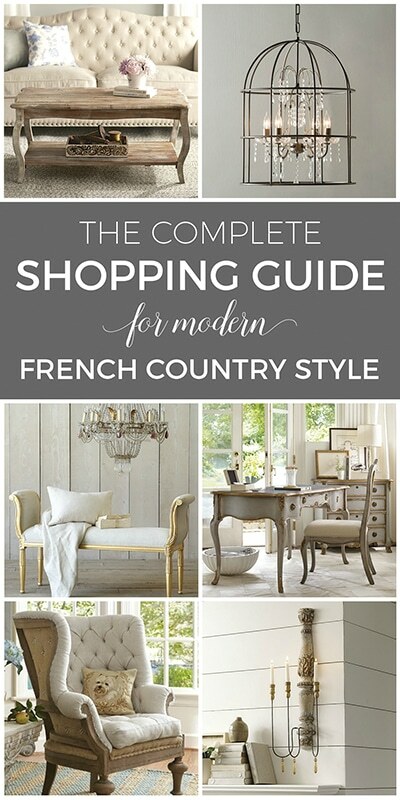 Your fireside for the fouth is fabulously styled, Lory! 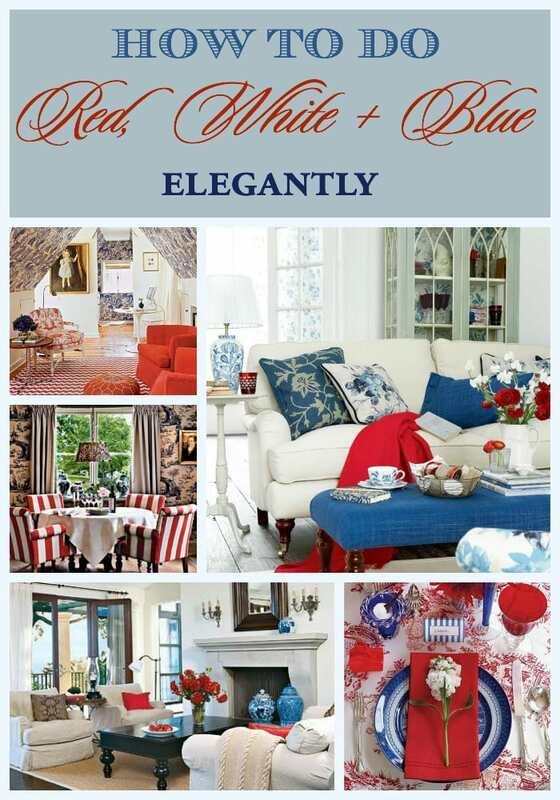 The patriotic hued textures, prints, colours and shapes blend so brilliantly together to create a delightful and dramatic setting. Hope you had a wonderful celebration! Hope you had a wonderful July 4th weekend ! Thank you so much Suzan! I am so glad that you stopped by my blog and left a comment. 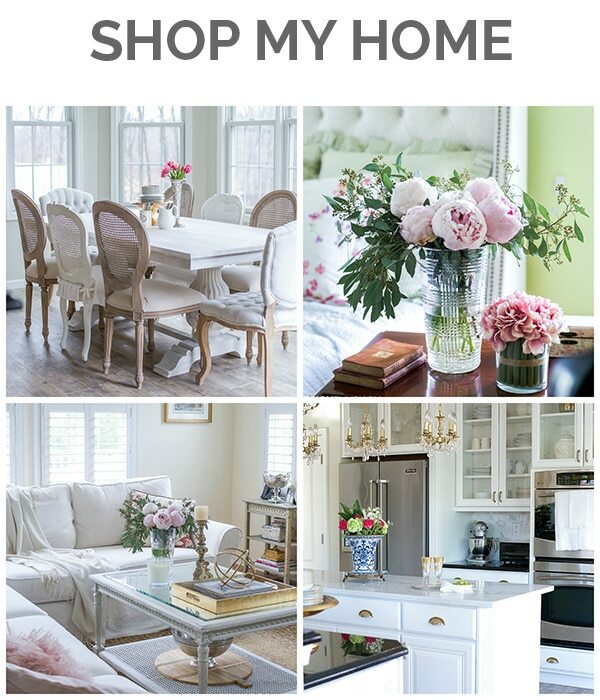 I have never seen your blog before, but I am loving it! Thanks for visiting, and I am adding you to my list of favorites. Thank you so much! 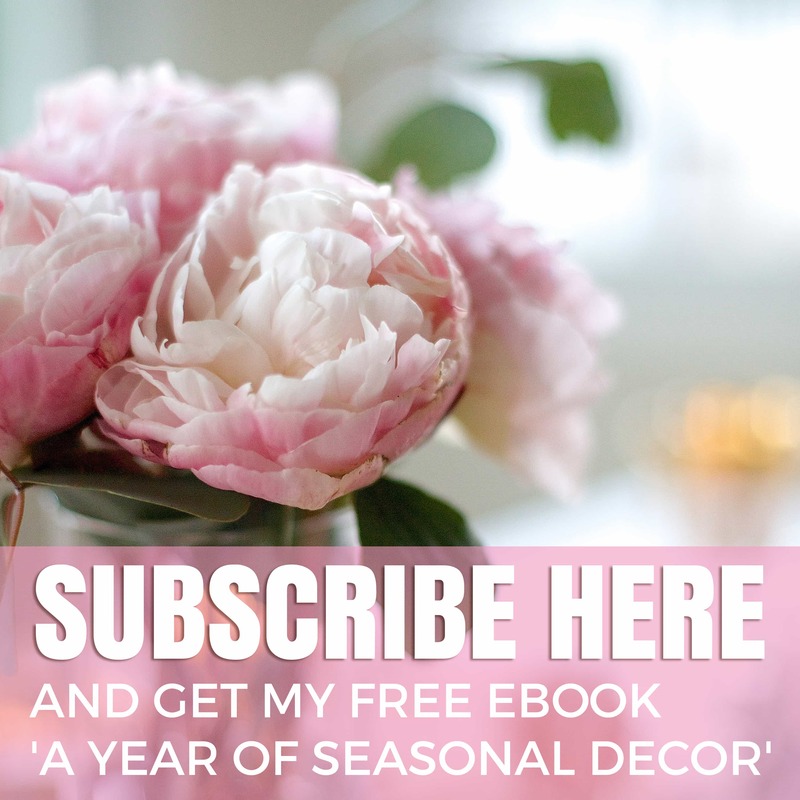 Yes, I just started my blog a few weeks ago, so thanks for the support… 🙂 I’m just getting the hang of how and where to subscribe to everyone, but I’m having great fun! 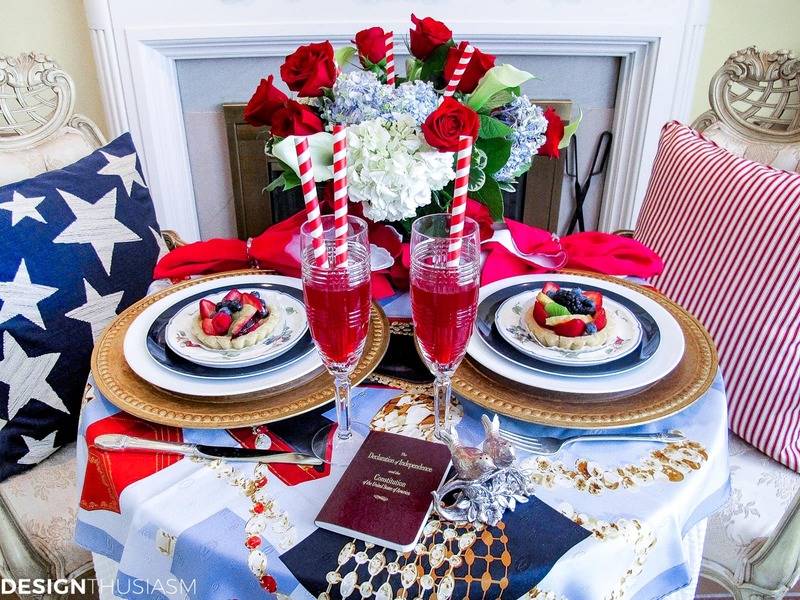 Love the intimate Fourth of July tablescape you created! What a great idea. The accents you used really express the feel of the holiday! Great tablescape Lory. I am loving those dishes and goblets! 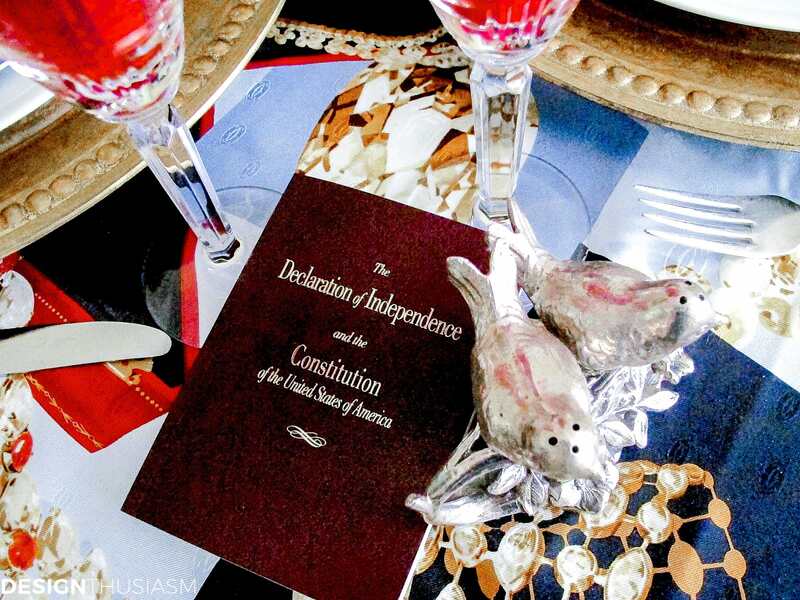 Now that I’m aware of a Constitution Day, I think a big “shindig” would be a lot of fun. There are so many ways to host a fun party. I do love a good themed party with costumes. I know not everyone is terribly thrilled about the idea of dressing up but how fun would it be to have a period style Constitution party? It could be an elegant semi-formal affair or even a casual outdoor shindig complete with games of the time. I wonder if any bloggers would be interested in doing a blog post with a tour? It would definitely be something new. Thank you for sharing your post with me. 🙂 Everything is beautiful! Ha ha… well, maybe next year… 😉 Thanks for the kind words!! Everything is quite fabulous here. I especially like the floral arrangment. 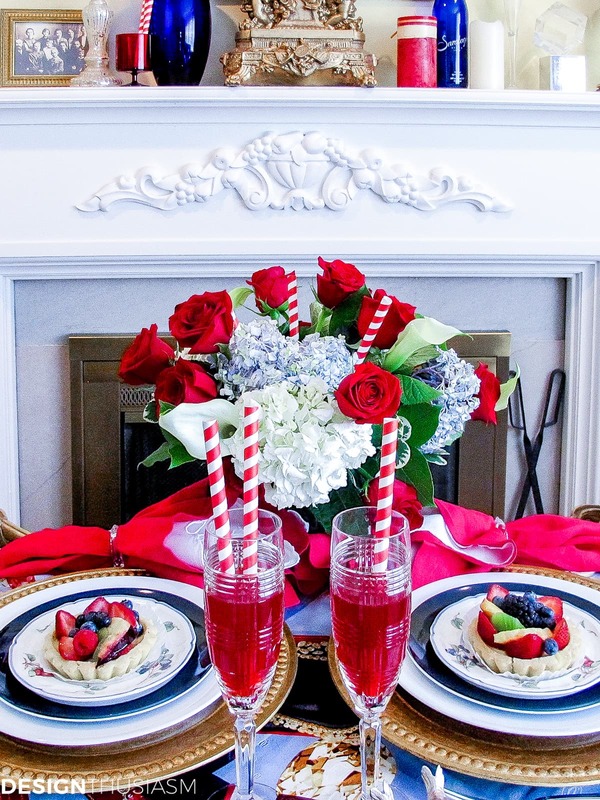 The soft colors of the hydrangeas mixed with the patriotic colors are wonderful and thos straws really made a great accent. You really have a wonderful decorating touch!